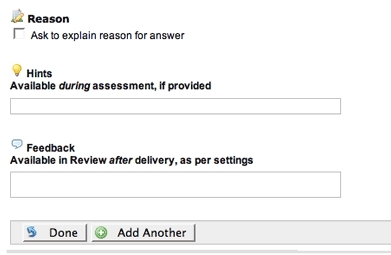 Task questions are identical to essay questions, except that they have an additional option under “Submission” types. The task question type is ideal for assignments that may include multiple components, one or more of which may not require students to submit something in Etudes. For example, you may have an assignment titled “Research Project” that consists of a) a research paper, and b) an in-class presentation of the findings. You can create one assignment with an essay question for the research paper and a task question with ‘no submission is required for this question’ for the in-class presentation. This setup allows you to award unique points to students for each component (question) of the assignment, and give them feedback for each separately. In the Question box, type your question or task that students must complete online or off-line.The title is an optional field. Under Submissions, check which method you’ll accept: inline, attachment or either. If students are not expected to submit something, choose the 4th option. Other options for the question include checking reason and adding hints and feedback.